Discussion in 'Tele Home Depot' started by preeb, Mar 16, 2009. I've been asked a lot about how I match the original 50's and 60's (mostly 60's of course) custom colors. As promised, I'll show you how I did this. 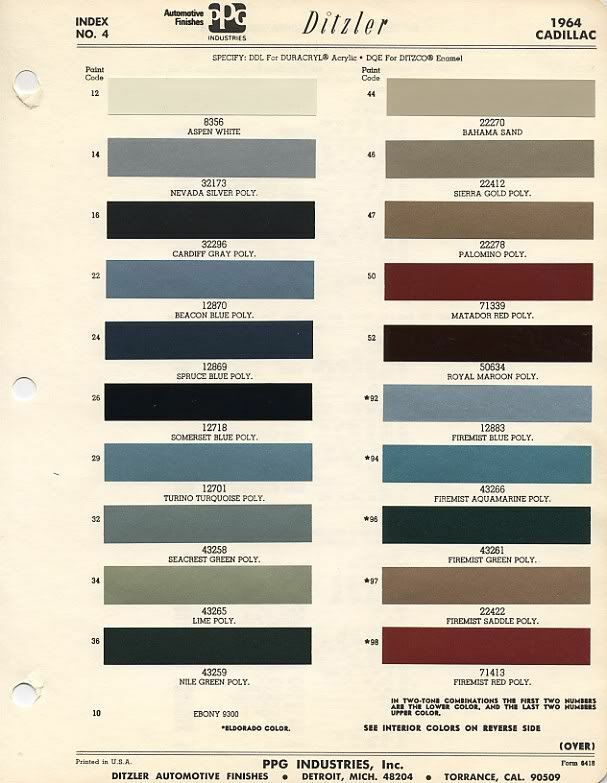 Fender used existing car paint for all their custom color options except for Candy Apple Red. They even used the original names for most of the colors. This is nice to know... but how can we use this info in order to get an exact duplication of the original paints??? There's another way. ORIGINAL WELL KEPT CAR CATALOGS. Well.. I started to look for the cleaner ones. Took me over two years to find all the originals that included the Fender custom colors paint chips, I started in late 2005 and completed the collection in 2008. Next step was to lightly polish the chips to get the possible oxidation layer off. It worked very well and the result was a complete set of vivid original paint chips for all Fender colors. I was looking for a way to reproduce the colors 100%. You can of course try to match them by your naked eye and get pretty close... but this wasn't the goal... I wanted it to be exact. gave it a try anyway. Came out close but some came out too light or too dark. I kept looking around some more and found a newer machine, much smaller in size that works in a different technology. It had no issues with the size of my chips and it came out great. I had to test all colors and compare them to the original chips of course and it cost me $70.- to process each color. So... here we go again... I put my trust in a local paint matching specialist here in Tel Aviv. It took him about 5 seconds to analyze the metalic powder type for each paint... most of them had the same type and size anyway.. I now had to mix the colors with the powder with some additives that make the metalic work and it did. I managed to complete my investigation and had all the Data in hand. I did notice however that some old Fender guitars that supposed to look the same... didn't. I compared the same color in neck pockets, under the guard etc... and what I'm trying to say is that even back then, not all factory batches for the same color looked identical!!! there are small variations. I went back to my chips and compared the same color but in different catalog years.... and there it was... inconsistency!!! it's minor but it's there. I gave up on any additional investigation. I'm happy as it is. Actually, that last sheet has several that catch my eye. Wow...sometimes it's scary. We do tick the same, Gil! About a year ago I purchased several of those paint chips catalogs as well on eBay!